I was mistaken on that guess in that several astronomers have already done it. Several readers of this blog replied that just one day after my prediction that it would not be seen, that it was photographed by amateurs. Moved to the Mountains, David, and Science Nerd and Theatre Impresario, Scott, forwarded news reports of the sighting. Thanks for that, David and Scott! Now, back to the other news stories. The image below shows on of the instances of spotting the Tesla, which just shows up as a little dot. 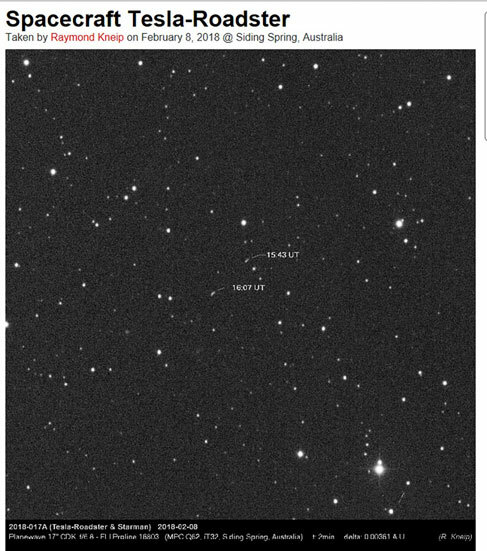 The two-minute exposure was apparently taken with a 17-inch remotely operated telescope in Australia. The Tesla was reported as being the same visual magnitude as a 16th magnitude star. The amateurs used a NASA Horizons tool to calculate where the Tesla was at in either RA or Dec space or in Elevation/Azimuth space from your location. I had seen this tool a couple of years ago, but had completely forgotten all about it and that is why I had erroneously guess that we would have to calculate the location ourselves, based on the Kelperian orbit elements provided by NORAD. Ok, ok, we don't have to do any of that work because this free internet based tool does all of the heavy work for us. Check out the webpage screen shot below. The website reference for this tool is provided in the caption. This tool can be used for most objects in the solar system. 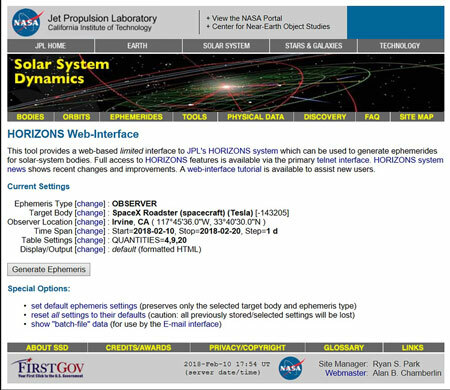 The Tesla is identified in the NORAD catalog as object, 43205, and in the NASA Horizons database as Starman or Tesla Roadster. I used the tool to search for when the Tesla would be visible, above the horizon, and found that here in California, it would be up between about 1:00 and 4:00 AM, local time. The screenshot below shows the Azimuth and Elevation from, say Irvine, CA, for the next 10 day period. So, it is just a little more than 20 degrees above the horizon and the visual magnitude keeps getting dimmer and dimmer from predicted 17.5 to 20 on February 20. The little Red Roadster is really moving out on its orbit around the sun. In reviewing why my prediction about it being seen was so pessimistic, I made two assumptions, which have been appropriate. One was that the visual magnitude of the Tesla would probably be dim or dimmer than typical geostationary satellites. I don't have any more up to date information on that. The other assumption was that the Tesla would be speeding away from the Earth at the escape velocity, which at the Earths surface is about 25,000 miles per hour and so it would be very far away very quickly. However, I forgot to include the effects of moving up and out of the gravity well near the Earth and although the Tesla would need to be exceeding the escape velocity, initially, its velocity would continue to decline as it continued on its journey out of the gravity well, somewhere near 8,300 miles per hour, yesterday. So, it is probably not really as far away as I had earlier estimated. Anyway, as fast as the magnitude is increasing, you are going to need dark skies and a big scope to see it after the 20th. Separately, on another topic, we received a suggestion from Gravity Guy, Ken, that first image of the Falcon Heavy shown in the February 8 post, might be sharpened up by some of the tools in Photoshop. Yes, Photoshop has got so many buttons and tools but I can hardly do the simple stuff. I tried the Sharpen tool and could see some changes and some bit of improvement, but the image still suffers from my poor camera focus. I know I need more practice in both areas. Anyway, thanks for that suggestion, Ken! 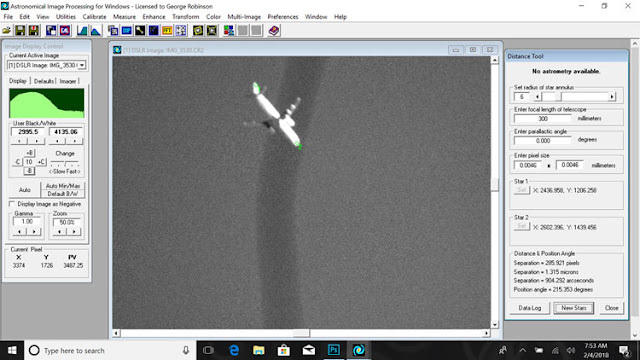 Finally, I can offer some introductory image analysis done on one of the aircraft images taken during an earlier practice session which used overhead aircraft as proxies for the upcoming rocket launch. Remember that I wanted to try out my tracking skills and shutter snapping skills as if the aircraft were the rocket. Anyway, AIP4WIN software was used to measure the length of the aircraft and given the focal length of the telephoto lens, we can measure its angular size. The angular size from this particular viewing angle is shown as 904 arc seconds, or 15 arc minutes. Then making many assumptions, such as the type and length of the aircraft, and not taking into account how the orientation of the aircraft makes its apparent length different from its real length, it is possible to estimate its slant range. I say slant range because the aircraft was not directly overhead and I didn't measure its elevation angle. I assumed the plane, similar to a B737, had a listed length of say, 97 feet. Anyway, my slant range estimate was 22,000 feet. I suppose I could practice more on making distance estimates, but that is not really needed. At least the aircraft enabled my practice session of tracking a moving target. As it turned out, it seems the rocket, even at 7.5 miles away, seemed to be changing position much faster than my practice aircraft target.